The yarn is 2 ply DK yarn. 1/3 cat fur, 2/3 fine merino. 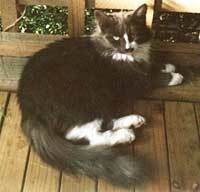 In 1999 we decided to give my father-in-law’s long-haired cat a haircut because the heat of the Australian Summer was leaving her gasping (literally), with no energy to do anything. After it was done she was very happy for the reprieve, thought during the haircut she was less than amused! Since my fibre was obtained from a cat “haircut”, I had to mix it with wool in order to be able to spin it. I had it carded at a ratio of 1/3 cat hair 2/3 fine merino. Usually you would use just the undercoat which you can save whenever you brush your cat. 1: Cat hair yarn felts very easily. After spinning your yarn you’ll need to felt it, so that it doesn’t felt after you have finishedwhatever you’re going to make with it. Tie your skein of yarn with twice as many ties as you usually do. (8 is a good number). Soak your yarn in hot water with ordinary laundry detergent or plain soap. Agitate it vigorously until it starts to stick together. Once it’s almost as felted as you desire, drain your water and plunge your yarn into cold water. Cold water from the tap should suffice. This last step is called “fulling”. It will harden your yarn slightly. Hold your skein by one end and beat it against a smooth surface (eg: the edge of your sink, top of your washing machine etc). This will help separate the threads somewhat and fluff up your yarn. If your yarn is thick enough to be handled while wet, reskein it so that it dries neatly. If it’s too delicate, let it dry, reskein it, soak it again and then let it dry once more. You might want to block it. 2: Spin very fine with a high twist or your yarn will shed like a cat. If you want thicker yarn then it’s better to spin a yarn with several ply than a thick single.